There are two methods by which you can install apps in your Android phone. Either you can directly install them from Google Play Store (undoubtedly, the best app store) which needs network connection or you can install them from apk file. Apk is the file format of Android apps, as like jpeg and png is the file formats of images. After installing the app, sometimes you may want to extract its apk file. Unfortunately, Android does not offer any official tool to help you extract apk file from installed apps but you can use number of third-party applications like ES File Explorer and APK Extracter. Again you need to download them from Google Play Store. What if I say that you can extract apk files offline without downloading anything. Yes, you can do this with SHAREit. We all have SHAREit app installed in our phone so need to download it. Although it is a popular sharing app which is used to send files at faster rate but it can used to extract apk files. In this tutorial, I will guide you how to make use of SHAREit to extract apk files from installed apps. Here's the basic logic behind this tricks. What we're going to do & why to use SAHREit? 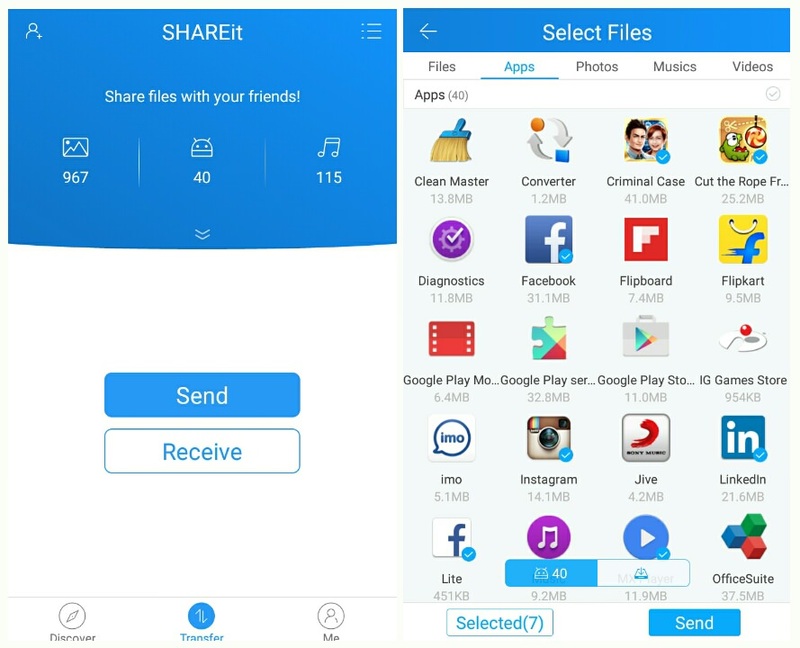 Apart from sending music, photos, videos and other files, SHAREit can send installed apps as well. It use Wi-Fi Hotspot technology to send files. I recommend using SHAREit because it's very fast in sending files between two devices. Using it, you can also extract multiple apk files simultaneously. Good thing about this trick is that, you don't need any root privilage. All what you need is two Android phones and both should have SHAREit installed in them (if not, then please install it). Basically it's a two-step process. First we will send the app from one phone to another using SHAREit. 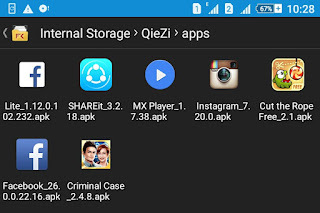 It will automatically extract its apk file and then save it in your phone memory under QieZi named folder. In second part, you've to send back this apk file to first phone via bluetooth or by other mean. As already mentioned, you need two Android phone for this tricks. Lets name both of them as phone-1 and phone-2. Now follow these steps to extract apk file from installed apps. First of all, open SHAREit on both phones. In phone-1, click "Send" button and move to "Apps" tab. Now find and select the app whose apk file you want to extract and then click "Next" button. Make sure to click "Receive" button in phone-2 simultaneously. After this, SHAREit will automatically save the extracted apk file in phone-2. To view it, open your primary file manager (I am using File Commander) and find "QieZi" named folder in your internal memory or in SD card. Now click "Apps" folder inside it and here you'll find all your extracted apk files. Finally send back them to the phone-1 again via bluetooth and you've done it. Note: SHAREit doesn't send any app data (such as cache & cookies) along with apk file and thus you don't need to worry about your private information. Next time if someone will install it, app will start from new end. Where you can use this apk file? As apk is a file, you can send it to your friends, cousins and family members via bluetooth/mail and they can install it anytime. You can also upload it on Google Drive or Dropbox to share it with other users on your blog/website. This is the best way to backup the apps installed in your phone. If you're planning to reset your phone settings, first extract all the apps apk file and then save them in your computer or SD card. After resetting, you can easily install them again without wasting your time and Internet data in downloading. If you're facing any problem, please let me know in below comment. I will get back to you as soon as possible. 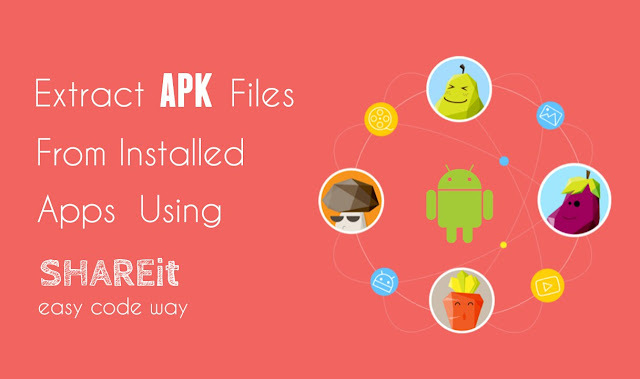 Is SHAREit good way to extract apk files? What do you think about it? Do you know any other better way? there is no next button, you mean send right?